Mom and I woke up early to catch the train to Gimmelwald! We found a Migros grocery store to get some breakfast and some snacks and water for the our trip to the mountains. I knew there weren't any grocery stores in Gimmelwald. 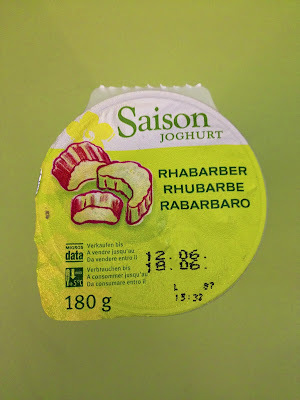 I picked up a hazelnut crossaint, an iced coffee, and a rhubarb yogurt--all of which were so delicious! We purchased lunch and then hopped on the clean and newer train. The trip to the mountains offered amazing views of beautiful Switzerland, which I was happy my mom got a chance to see. We had a nice map on our train table, which helped us figure out where we were headed to! There was a sweet couple from India across the way from us on the train and we chatted with them quite a bit. 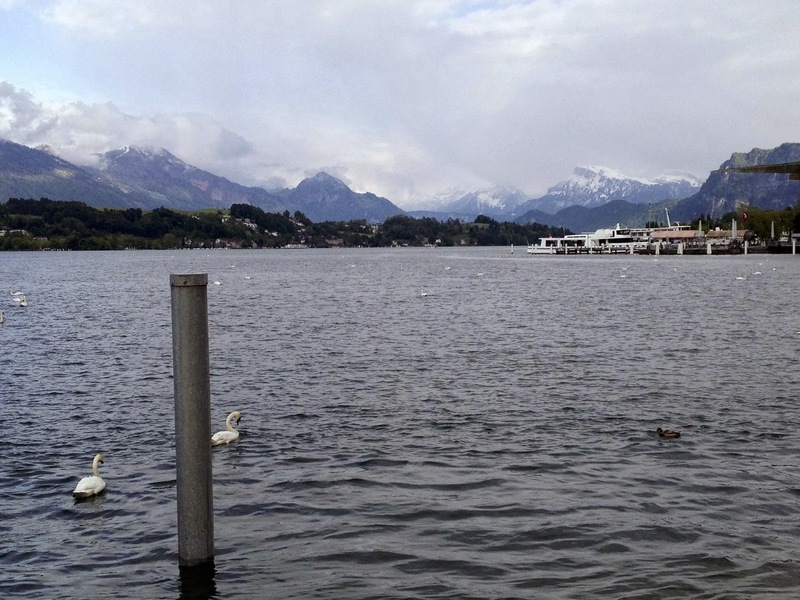 They had never seen snow until their trip to Interlaken, which was fun to hear! I love talking to random strangers while traveling, even if I am normally a little bit shy. Talking to them offered different views out the window too! 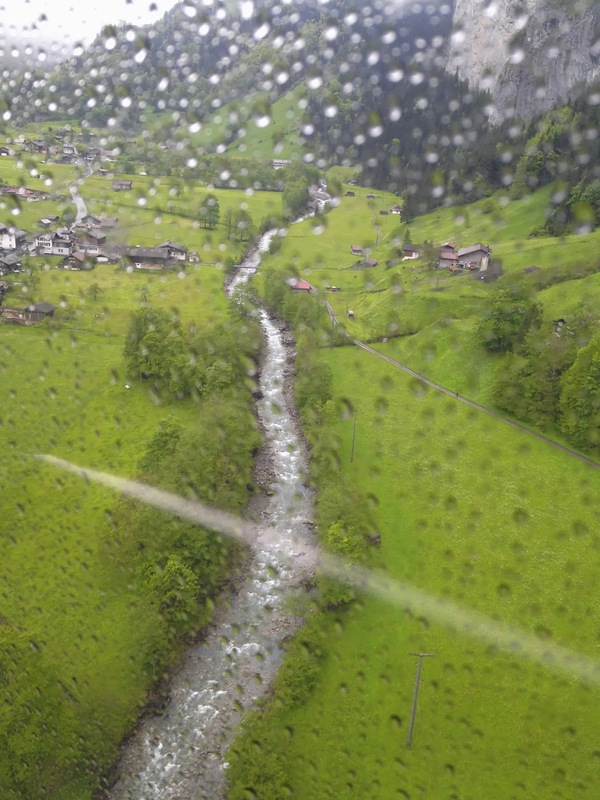 Once we arrived at Interlaken, we caught a train to Lauterbrunnen. Exiting there about twenty minutes later, we had to board a bus to Stechelberg across from the train station and went through the valley. Check out Trummelbach Falls--it was so gorgeous! The falls are a series of 10 waterfalls coming from the base of the Jungfrau. The bus took us to the cable car station and we had to lug our huge suitcases up the stairs, not fun! It was a little scary in the foggy, rainy weather, but we made it safely! Mom didn't expect the cable car to be so big and I think she felt a little more reassured by the size. Just a note for anyone who plans on traveling to Gimmelwald: we purchased a ticket that covered the train ride, bus and the cable car fees. It seemed easier to do it that way than to deal with cash. Here is the station at the top! The town of Gimmelwald is not that big, but we still found it difficult to find the house where we were renting a room in. I saw photos online before our trip, so I figured out that it was this place. We also had trouble figuring out how to get in and the lady we were renting the room from was at work and we had no clue where work was for her. That was pretty frustrating at first and then I figured out that the key was in our separate door and that we were trying to get into her side of the apartment! The place we stayed at was called Liesi's Heart Place and she thought of every little detail when putting together a room to rent in her house. The bedroom was separate from the bathroom, which was just down the hallway. My journal notes that I thought mom would get bored really quickly in Gimmelwald and I was right. But, as I told her, we needed to rest a bit since we were spending lots of time in big cities and walking so much every day. I noted that I was sick of big tour groups and the smell of cigarettes. Gimmelwald definitely had neither of those! We stepped outside to take some photographs of the outside of our little temporary house and then we went back in for an hour nap, which felt great to take! Our entrance was on the right and Liesi's was on the left. A view of our place from above! It really looks like it's right on the edge of the mountain here. Once nap time was over, it was time to explore the city! I met this guy right away and he ended up being my little cat stalker two days in a row. Like all of the cats I met in the mountains, he was super friendly and I really missed Tanzi. These goats were quite talkative and fun to watch! Back towards the more busy side of town, we found The Honesty Shop. As the sign says, it's Europe's first unattended self-service village shop. We didn't find anything we needed or wanted, but it was fun to check out the random things for sale. We found the Mountain Hostel, which has the only restaurant in town at that time of year (others open up in the summer). The dinner menu had pizzas and traditional Swiss dishes like raclette and we thought we'd come back for dinner, but we never did. We also found Erika's cheese hut, which pointed to her house to purchase some cheese, as she also seems to open up shop when the town gets busier. I loved the huge cow bells on this house. Back at the room, I couldn't help but look out the window quite often. It was so beautiful there! I did miss having wi-fi and felt bad that we couldn't let Craig and my dad know that we were safe. Mom and I both settled in and read books. 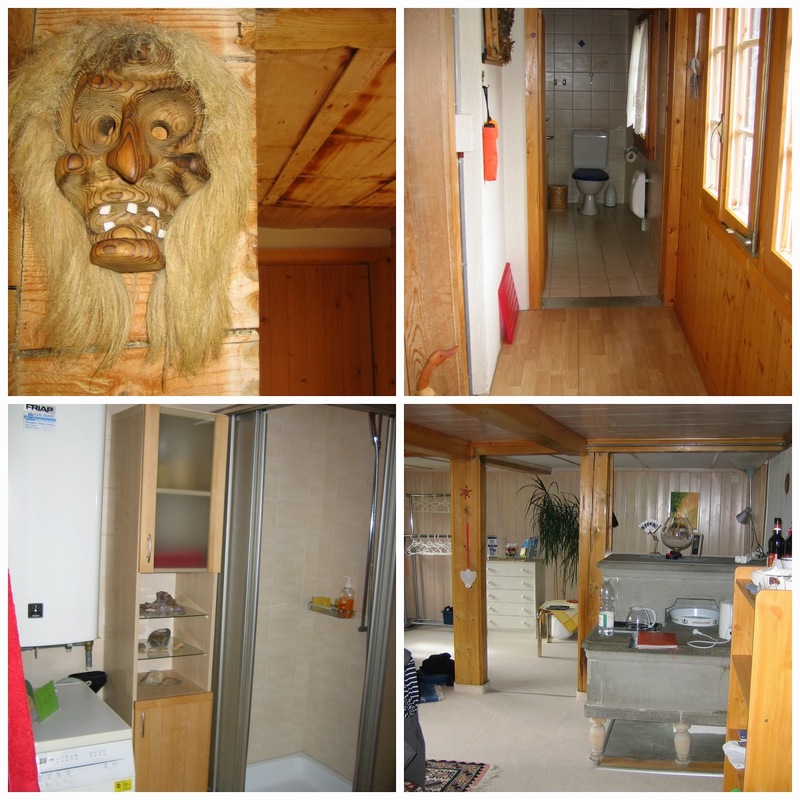 We also plotted out our trip to Mürren the next day! I'll write a separate post about that next. I'm finally checking in after celebrating Christmas three times over the last week. We started out with Craig's mom's family on Christmas eve. I scored a nice bottle of Snoqualmie Riesling wine during the dirty Santa game! Craig won some Victoria's Secret lotion in a scent I just happen to like. I headed to my parents' house on Christmas day to open gifts and make Linzer cookies with my mom. It was so much easier to bake in her kitchen! 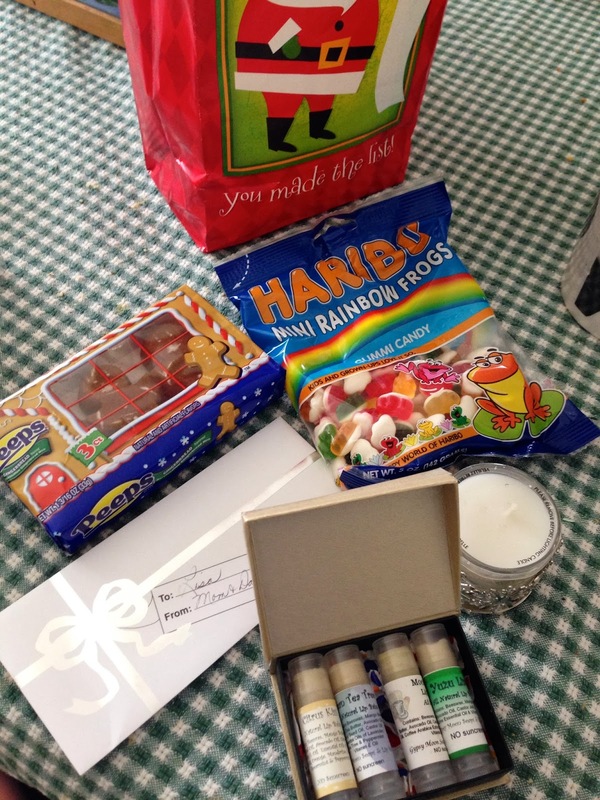 I received cash, candy, natural lip balm made locally and in a cute box, and a candle. 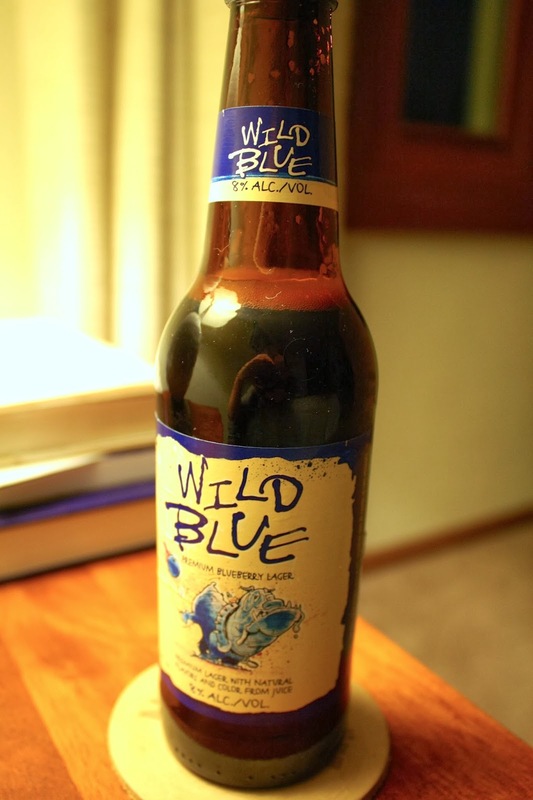 Later that night, I enjoyed a delicious blueberry flavored beer with dinner. Craig and I watched The Grinch (Jim Carrey version). He hadn't seen it before and I enjoyed seeing it for the second time. I was kind of bummed I had to go back to work the day after the holiday. Luckily, my brother and his family came to my work to visit and I spent a lot of time with them, so the day flew by. I had a half day of work on Friday and met friends for brunch at Benelux. I enjoyed a delicious and healthy tasting Quinoa Skillet with two fried eggs on top. Our final celebration of the holidays took place with my side of the family at my parents' house on Friday evening. Truthfully, this was one of the most relaxing Christmases we have had in a long time. We opted out of exchanging gifts with a few people and it felt good not to collect more possessions we didn't need. Because we just got kittens, I also didn't put any holiday decorations up (except a wreath on our front door) and while I missed the mini tree and cute ornaments that go with it, it's nice not to have to take everything down now! 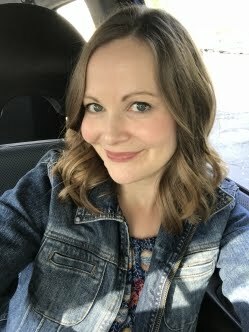 I took off of work this week, so I am just looking forward to some relaxing mixed in with other activities! We left Munich at 7:30 a.m. Mom and I knew that we had to prepare for the long train ride by buying sandwiches, yogurt and coffee. We had to transfer trains in Stuttgart and Zurich. In Stuttgart, mom and I ended up running to get to the next train a couple of tracks over and we were out of breath! Thankfully, we made it, but I hate being in those situations with tight schedules. 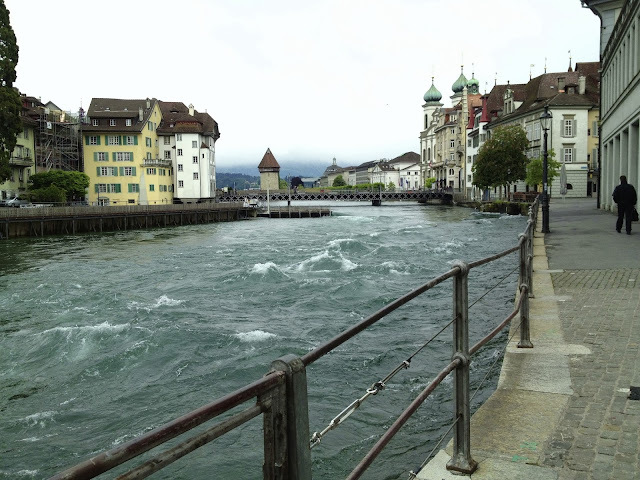 We finally arrived in Lucerne at 1:50 p.m. I hadn't been back to Switzerland since living there for 6 months from 2005-2006. 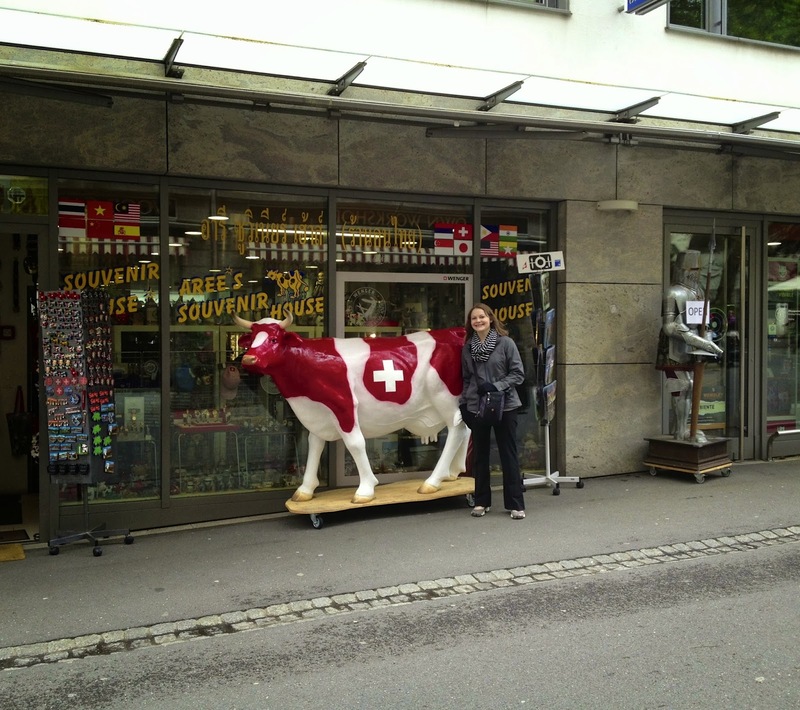 I really loved living in the country and missed seeing the gorgeous alps, cows, and the friendly people. While Lucerne is a beautiful city, it's also very touristy and expensive. My mom noticed the prices being super high right away, especially compared to Germany. We stayed one evening there, basically as a stopover before we headed up into the alps, which is a lengthy trip. 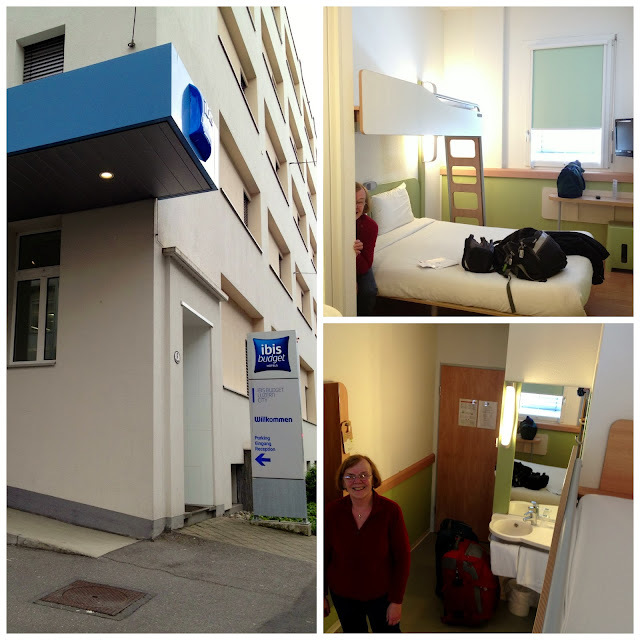 Hotel prices in Lucerne are also pricey, so we opted for a basic and small room at the Ibis budget Luzern City. This is the neighborhood the hotel was in, behind the train station and in a more residential district. On our way to find the hotel, a kind old woman saw that we looked lost and asked where we were going. She asked me in Italian, so I responded back in a little Italian as well and then we exchanged a few German words too. Oh how I missed the Swiss and their ability to learn multiple languages! Once settled in at the hotel, we explored the city! 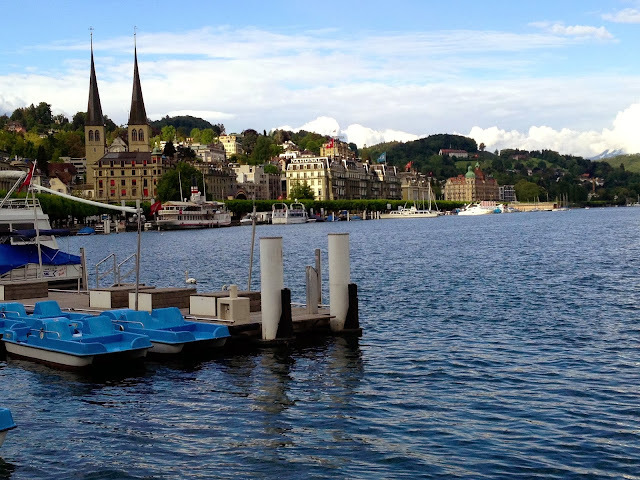 Like a lot of cities on our trip, I had been to Lucerne once before with friends. I went around Halloween time and it was a fun time of year to be there. This time, it was much colder and windy! Here's mom at Chapel Bridge/Kapellbrücke. The bridge is the oldest covered one in Europe still surviving. It did undergo restoration. I found some interesting information about the tower on Wikipedia: "The tower predated the bridge by about 30 years. 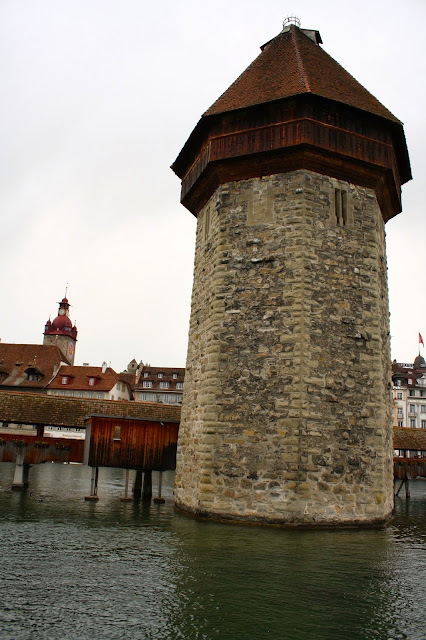 Throughout the centuries, the tower was variably used as a prison, torture chamber, and later a municipal archive. Today, the tower is closed to the public, although it houses a local artillery association as well as a tourist gift shop." I wanted this woman to move so badly so I didn't have her in the photo. I need photoshop for that I guess! 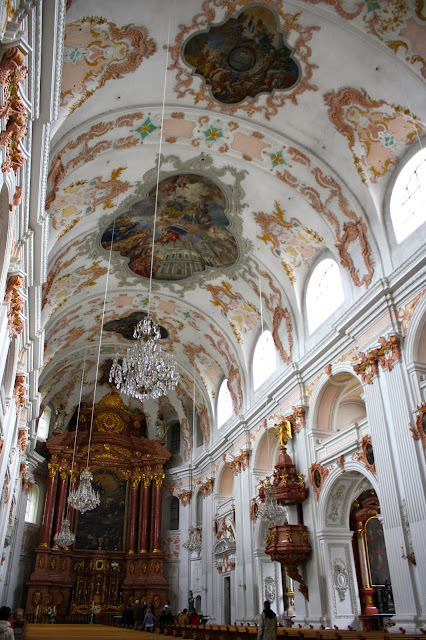 I was excited to show my mom the Jesuit church, since it's so gorgeous on the inside and she is a practicing Catholic. I even snuck this photo of her putting the holy water on her forehead. See, I told you the interior was beautiful! The river was treacherous in some parts. 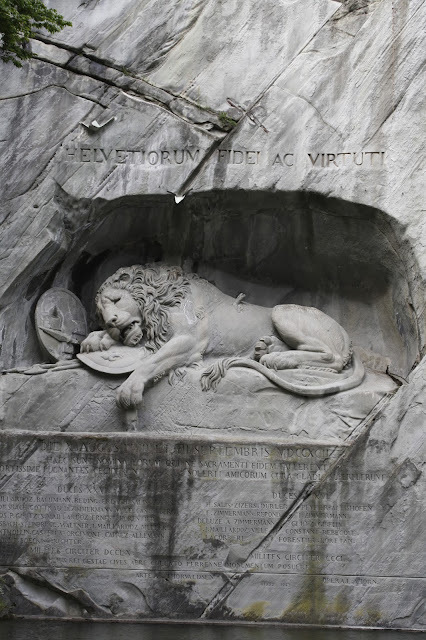 We shopped a bit and then made our way to the Lion Monument, which is another thing that Lucerne is well-known for. Another nice Wikipedia summary of what the monument is all about: "a sculpture designed by Bertel Thorvaldsen and hewn in 1820–21 by Lukas Ahorn. It commemorates the Swiss Guards who were massacred in 1792 during the French Revolution, when revolutionaries stormed the Tuileries Palace in Paris, France. Mark Twain praised the sculpture of a mortally-wounded lion as "the most mournful and moving piece of stone in the world." I got a little silly at a statue of a lion nearby. We opted to eat our dinner at a grocery store again vs. a restaurant. I was happy to find a Coop inside a mall, so we went there. I loved Coop when I lived in Lugano. I bought an aloe vera watermelon and peach drink, a spinach strudel, and my favorite, Birchermuesli. This was mom's first time having an excellent Birchermuesli and she loved it! The Swiss know how to make it correctly and they should, because they're the ones that invented it! Dinners like this sometimes make me more happy and they aren't so tough on my sensitive stomach. It started to get even colder out, so we headed back to the train station to shop for gloves and a hat for me. I forgot to bring them for our trip up into the Alps. I asked for them at a couple of stores (simply by saying, "handschuhe? ", but since it was Spring, they had none to sell me. I was imagining myself freezing in the 20 degree temperatures and snow showers predicted for the mountains the next day. 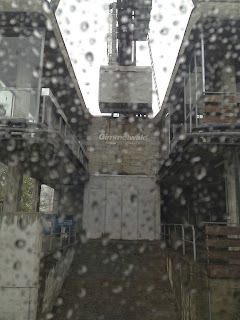 We also bought our train and bus tickets to Gimmelwald for the next day and for the way back into Germany. This is where I learned that I should have double checked a few things, as we were sold tickets that were incorrect and later had to purchase another ticket to get us to the right train station in Basel. I had a bad feeling because I had been to Basel before and knew there were two train stations, so I did ask and he still messed them up, perhaps because his English comprehension was not the best. Back at the hotel, I was so happy to have wi-fi for free in our room (not a common thing in Europe) and so I Skyped with Craig and Facetimed my Dad and did research on the next leg of our trip.